Strawberry producers in the southeastern United States produce 2,419 million pounds of fresh berries per year. The market for berries produced in southeastern states (primarily Florida and North Carolina) has grown substantially in recent years, with production increasing from 129.2 million pounds in 1990 to 203 million pounds in 2012. The large majority of this production is produced under annual plasticulture systems planted with June bearing varieties. In North Carolina, this production is characterized by marketing toward u-pick customers and local markets. While there continues to be a demand for locally produced berries, there are particular challenges related to growing strawberries in the Southeast. The history of many farms currently producing strawberries throughout the Carolinas is often one of land being converted from intensive tobacco production to intensive strawberry production. This long-term use of single plots of land for annual production can lead to decreases in land productivity due to exhaustion of nutrients and soil organic matter. Soil quality losses can be exacerbated by the tendency to re-plant each year in the same location because of land availability or marketing strategy. Additionally, spent strawberry fields allowed to remain fallow during the summer months can lead to increases in soil erosion, soil moisture loss, and the buildup of weed seed banks. Further, a lack of crop rotation leads to insect and pathogen build-up, often resulting in an increased need for chemical inputs. While annual fumigation practices may reduce the risk associated with soilborne pests, this practice also removes helpful biological life that contributes to soil health. In order to maintain the long-term viability of strawberry production, practices that not only improve the short-term productivity of the land but also contribute to long-term land stewardship must be incorporated into the production cycle. Such are the goals of sustainable management practices. This publication will outline sustainable management practices that are appropriate for strawberry growers in the Southeast, the benefits of these practices, and how they may be incorporated into plasticulture production systems. We will not give an in-depth overview of the basics of strawberry production here. Rather, this publication is targeted towards growers, managers, and extension personnel interested in incorporating practices that promote ecological function and long-term land quality into their strawberry production systems. The practices and recommendations put forth in this publication are based on strawberry research conducted in the southeastern region of the United States. However, many of these practices have also been demonstrated to be widely applicable in other regions and to other horticultural and agronomic crops. More generally, sustainable agricultural practices promote the long-term viability of natural resources found on a farm and limit negative environmental impacts that can occur as a result of agricultural production systems. In addition, sustainable agricultural practices must also recognize the social well-being of the farmer and the need for economic viability of the farm enterprise. When production practices are carefully chosen for a particular site and situation, on-farm resources can be both utilized and conserved, the reliance on off-farm resources can be limited, naturally occurring biological controls can be maximized, and the potential for contamination that harms human and environmental health can be reduced. Examples of sustainable practices include the use of composts, cover crops, crop rotation, protection of beneficial insect habitats, and the use of cultural controls to prevent pests. In this publication we will focus most heavily on the land stewardship part of sustainable agricultural production. However, many of these practices can also support the other two pillars of sustainable agriculture: long-term profitability and quality of life for growers and their communities. What is the difference between “Sustainable” and “Organic”? Organically produced products are not the same as sustainably produced products. Organic, in the United States, refers to rules and production standards that are set by the United States Department of Agriculture (USDA) National Organic Program. Organic production practices primarily include not using synthetic fertilizers, synthetic pesticides, genetically modified organisms, and sewage sludge. The phrase “sustainable practices” does refer to and include many practices that are used by and required of certified organic producers. However, unlike the “organic” label, the “sustainably produced” designation does not require any verification or certification on the part of the producer. The term “sustainable” can therefore be used indiscriminately, and a producer should be ready to explain their use of this term when it is incorporated into marketing language. However, growers who are able to promote their use of sustainable production practices may find it a boon to their marketing strategy, as consumers are becoming increasingly interested in how food is produced. For more information on organic strawberry production, see the “Other Resources” section (see section). Why Incorporate Sustainable Practices Into Plasticulture Strawberry Production? While long-term land stewardship is a concern for all growers, the more immediate concern of maintaining high yields is often the primary driver for choosing which practices to incorporate into a production system. For many of the sustainable practices discussed in this publication, research has shown direct links between incorporation of a practice and increases in strawberry yields. For other practices, the value lies not in immediate increases in yield but rather in improvements to soil quality, services provided by beneficial insects, or in reductions in pest or pathogen populations, all of which can result in yield benefits in the long run. While the economic side of implementing any production practice is of utmost importance, the cost-benefit analysis of incorporating sustainable practices into a production system will vary for each grower based on labor costs, availability of materials, access to equipment, and local conditions. An analysis of the economics surrounding the implementation of sustainable production practices will be published in 2015. Soil quality (aka “soil health”) is a measure of the ability of the soil to provide services such as supporting plant and animal growth and maintaining water and air quality. Soil quality is complex, and it is measured by looking at things such as soil microbial populations, the ability of water to infiltrate the soil, and the ability of the soil to resist erosion and maintain soil aggregates. These qualities of the soil will change based on how the soil is managed. Maintaining healthy soil is critical to sustainable production of strawberries. Often what lies beneath our feet in the field is a source of worry, whether it is low fertility or possible disease presence. Growers also know, however, that a healthy soil can contribute to successful crop production. Factors that contribute to a healthy soil include a diverse microbial community, a healthy amount of organic matter, good soil aggregation (the ability of a soil to hold itself together), and a balanced soil nutrient content. Many of these factors can be measured and are used as indicators of soil quality. Maximizing the functioning of these processes through production practices can ensure long-term soil quality and crop productivity. The addition or conservation of soil organic matter is the basis of many benefits of sustainable management practices. Increasing organic matter can improve soil structure or aggregation, increase the nutrient-holding capacity of soil, and support a more diverse soil microbial community. The resulting soil structure improvements can lead to reduced erosion, better root growth, greater infiltration and drainage in clay soils, and an increased water holding capacity in well-drained soils. For the many sandy soils found in many parts of the Southeast, increasing organic matter levels can greatly increase water holding capacity and the retention of soil nutrients. While there are soil microorganisms that are well known for causing plant disease, there are also soil microorganisms that encourage good plant growth. Beneficial soil microorganisms contribute to plant growth by producing plant growth-promoting hormones, providing protection from plant pathogens, fixing nitrogen (e.g., rhizobia bacteria), enhancing plant drought tolerance, increasing soil aggregation, or converting soil nutrients into forms that plants can use. Just as a city has lots of jobs that must be filled by many types of people who have job-specific skills, the soil benefits from diverse soil microorganisms that are capable of performing different jobs in the soil community. However, strawberry systems with histories of annual fumigation or low levels of soil organic matter often lack sufficient populations of beneficial microorganisms in the soil. By implementing practices that increase diverse populations of good microbes, growers can put these microbes to work to combat disease-causing microbes and produce plant growth-promoting compounds. Finally, the use of sustainable practices, such as the addition of compost and cover cropping, can contribute nitrogen, phosphorous, potassium, and micronutrients to the soil. Pests are organisms, including insects, mites, microorganisms (e.g., fungi, bacteria, and nematodes), or weeds, that negatively affect crops. A key to reducing pest pressure on a farm is to provide breaks in the crop cycle. Soil management practices such as crop rotation, cover cropping, or additions of compost can help provide this break in pest life cycles and contribute to reductions in pest occurrence. Another way to naturally suppress pest populations is to maintain populations of beneficial insects on the farm. Beneficial insects are those that feed on or otherwise kill pest insects. Important considerations for promoting beneficial insect populations include providing appropriate habitats for them and planning any pesticide spray applications so that non-target effects are minimized. Pesticide drift, fertilizer runoff, erosion from alleyways or bare ground, and air pollution from fumigation are some potential environmental impacts of strawberry production. Sandy soils that are low in organic matter are particularly prone to losses of fertilizer by leaching. Some of these negative impacts can be reduced by using appropriate pesticide and fumigation practices and by planting cover crops or alleyways to reduce the amount of time the soil is bare. Using compost and cover crops as nutrient sources also generally reduces the potential of nutrient loss due to leaching and run-off as compared to chemical fertilizer sources. As with any type of crop production, site preparation is essential for future success and profitability. For strawberry production, choose a site that receives full sun, has well-drained fertile soil, and is accessible to irrigation hook-ups and easy transportation of harvested fruits. For u-pick operations, visibility of the field is key. For long-term sustainability, several plots with these characteristics should be identified for annual rotation of the strawberry crop when possible. For both growers who are just starting out and seasoned producers, annual soil testing can be invaluable for gauging which soil nutrients are required for the subsequent cropping cycle and whether the soil pH needs to be adjusted. Understanding these basic properties of your soil and any changes in them over time can be a powerful tool in preventing costly crop losses and ensuring healthy crop establishment. Consult the list of testing agencies at the end of this publication or check with your local extension personnel to identify a testing center in your area. In order to receive appropriate soil nutrient recommendations when submitting a sample, remember to indicate that strawberries are your next crop. Most testing agencies provide an easy guide for interpreting soil test results. Soil nematode sampling can be conducted similarly, with samples being taken over an area and mixed together in a plastic bag to be submitted as one sample. Nematode sampling is a valuable diagnostic tool and should take place in early summer to determine the types of nematodes and the size of their populations in a given field. Nematode sampling can be insightful for growers who are starting out and using land that does not have a history of fumigation or for growers who notice localized declines in crop growth within a field. In order to assess long-term changes in soil quality and soil health, additional specialized testing is required outside of what most basic testing agencies provide. A few of these specialized tests might include aggregate stability, organic matter content, and microbial activity. Some of these tests are basic and can be performed on-farm by the grower, while others require submission of soil samples to the testing facility. The Cornell University Soil Health Laboratory has a free training manual that provides details of how to perform these types of analysis. For more information on testing services in the Southeast or Cornell’s testing services, review the section “Other Resources” (see section). How and When Do I Soil Test? Soil samples should be collected from each management area within a field. A management area is an area that receives the same management practices and fertilization schedule. Collect 10 to 15 soil cores randomly throughout the area. The 10 to 15 soil cores should be gathered and mixed together in a bucket. The mixed sample can then be sent to the preferred soil testing agency. Low or otherwise abnormal areas should be avoided or sampled separately if a diagnosis of the problem area is desired. Soil tests should be performed at the end of the cropping cycle in early June so that there is time to add any amendments recommended by the soil test results. Once you know the status of your soil, you can begin to make decisions about how you will manage its production potential and long-term health. The power of crop rotation should not be underestimated. Crop rotation provides a break in pest-cycles, allows other crops with different rooting depths to bring nutrients from below, and provides an opportunity for the soil to rest after the intensive cropping of strawberries. Just as a diversity of soil microbes is good for the soil, so is having a diversity of plants in a crop rotation. For strawberries grown in an annual plasticulture system, crop rotation should take place annually if sufficient land is available. The greatest benefit from crop rotation is seen in rotations in which the cash crop (i.e., strawberries) is planted on the same piece of land only once every three to five years. However, if growers are unable to rotate where they plant their strawberry fields each year, other management practices can help to provide relief to intensively managed soils. Composted materials incorporated into the soil can increase organic matter, improve aggregate stability, decrease soil erosion, and promote soil microbial activity. In clayey soils prone to standing water, water infiltration can be increased. In sandy soils that do not hold water well, adding compost can increase water-holding capacity. Organic matter in the soil acts like a sponge that holds water while allowing the excess to drain. In addition, compost can be a slowly available nutrient source for plants, providing nitrogen and micronutrients. Compost has also been investigated as an alternative to fumigation with some positive results, but thus far has not been found to be as effective in controlling soilborne diseases as chemical fumigation. The use of locally produced compost or the production of compost on-farm, when feasible, will increase on-farm nutrient cycling and make applying compost more economical. To avoid plant injury, any applications of compost should be tested for their nutrient and salt make-up or applied well in advance of strawberry crop establishment. To avoid nutrient toxicities, it is important to test compost for excessive nutrient and salt levels. Some testing services not only provide information about the total amounts of nutrients in the soil but also provide estimates of the amounts of nutrients that will be available to the next crop. If there is reason to suspect that heavy metals might be present at hazardous levels, these should also be tested for. In addition, growers who annually apply compost should soil test every year to monitor nutrient changes. Due to USDA restrictions on the application of fresh manure regarding potential pathogen presence and the potential to over-apply some nutrients (particularly Phosphorus), composted manure is preferred over fresh manure. However, it is important to be aware that even some manure-based composts can have high phosphorus or salt concentrations, and excessive use of these products may lead to nutrient toxicities. Having the material tested prior to application can prevent these potential issues. Compost can be applied in early summer, following the end of the strawberry season and removal of plastic, or just prior to raising beds in the fall. Applying compost prior to seeding cover crops also greatly reduces risks associated with plant burn if the compost has a high salt concentration. However, high quality compost applied just prior to plastic laying can improve fall plant establishment. There is a dual benefit to applying compost in early summer followed closely by cover crop establishment. The cover crop will benefit from the nutrients provided by the compost, and much of these nutrients will be returned to the soil when the cover crop is incorporated into the soil. There is a dual benefit to applying compost in early summer followed closely by cover crop establishment (see image). Rates of application should vary based on the nutrient content and cost of the material you are using. Generally, rates of six to ten tons of compost per acre are adequate. Multiplying the rate of application (pounds/acre) by the estimated nutrient content of the material will give an estimate of the pounds of nitrogen, phosphorus, potassium, and other nutrients that the material supplies per acre. Once the nutrient content of the material is determined, pre-plant fertilizer applications should then be scaled back appropriately. Compost should be applied evenly over the field and incorporated to a depth of several inches, ideally within several hours after application. Incorporation of the material results in the retention of a greater percent of nutrients for the subsequent crop. A cover crop is a crop that is planted for the benefits it provides to the soil, but it is not harvested or sold. Most often, after the cover crop has grown and accumulated substantial biomass, it is mowed and the biomass is left on top of the ground or tilled into the soil. Soil incorporation of summer cover crops is preferable for plasticulture strawberry production. Benefits of cover crops can include adding nitrogen to the soil, increasing soil organic matter through crop residues, preventing erosion by covering the soil when the field would otherwise be left fallow, preventing water loss from the soil, reducing soil compaction, and suppressing weeds. Summer cover crops can be fit into a strawberry production system with advanced planning. Your specific goals and reasons for including cover crops will determine what type of crop is appropriate. There are two broad classes of cover crops: legumes and grasses. The use of a leguminous cover crop in the summer provides the benefits of erosion control, creates a break in the strawberry crop cycle, and allows farmers to “grow” their own nitrogen fertilizer via the fixation of nitrogen by the plant’s roots. However, grass cover crops generally provide much more biomass than legumes, are better at suppressing weeds, and will ultimately provide greater amounts of organic matter to the soil. A mix of a legume and grass provides the benefits of both crop types, and the grass can help support the vines of the legume crop. For more information on the specific characteristics of some common summer cover crops that are appropriate for the Southeast, see Table 1. Sometimes crops from the mustard family (Brassicaceae) are considered as a third group of cover crops. Plants from this family are often planted for their pest suppression capabilities and their bio-fumigant effects. This is an emerging area of research for strawberry production in the Southeast. The most important consideration for incorporating summer cover crops into plasticulture strawberry production is the issue of time. In order to get the most benefit from the short window between strawberry production seasons, it is important to establish the cover crop as early as possible in the late spring or early summer. The longer the cover crop has to grow, the more biomass and nutrients that can be accumulated in the plant tissue. In a year or region where the strawberry season extends well into June, a grower will have less time to establish the cover crop before it will need to be mowed and tilled in before making fall strawberry field preparations. Thus, in some years, a short-season cover crop might be more useful than a more slowly maturing one. Your land and specific conditions will also influence what crop or combination of crops is most appropriate. Temperature ranges, expected rainfall, soil texture (sandy vs. clayey), and slope of the site should all be taken into consideration. For instance, some cover crops may require supplemental irrigation to become established or may perform poorly in wet soils. Reminder: When planting a leguminous cover crop, use an appropriate soil inoculant to ensure rhizobia bacteria are present in the soil. This is especially important if there is a history of soil fumigation or if there is not a history of other leguminous crops being planted on the land. Seeding rates will be determined by multiple factors, including the cover crop or combination of cover crops chosen and the amount of time available to establish and grow the cover crop between cash crops. For instance, when a mixture of a grass and legume is used, the legume is generally planted at slightly less than its full rate while the seeding rate of the grass is reduced to less than half of its full rate. On the other hand, greatly increasing the seeding rate of a grass when it is planted individually will result in greater competition between plants and thinner stalked plants that break down more quickly in the soil. If there is only a short window for the growth of a cover crop, increasing the seeding rate can lead to increased biomass production as compared to a using a lower seeding rate. Some cover crops, such as cowpea and buckwheat, are known to have “extrafloral nectaries” that are food sources for some beneficial insects. Planting these crops may help sustain and promote populations of these good insects between cropping seasons. Using machinery that places the seed at the correct depth and spacing will greatly increase the success of cover crop establishment. A grain drill can be used but it is easy to broadcast seeds with handheld seeders for smaller areas. It may be necessary to make a few test runs to calculate and correctly calibrate your seeder to the cover crop’s planting requirements. Extra time spent calibrating equipment to achieve the correct seeding rate will pay off over the course of the season in good crop establishment, crop growth, and particularly, in weed suppression. Machinery that can mow and incorporate the cover crop must be available in late summer and is an important consideration because some cover crops may grow more than six feet tall. Flail mowers are generally preferred for cover crops that produce a large amount of biomass because flail mowing will reduce the tissue to small pieces that can be easily incorporated into the soil. Several passes with a mower may be required to sufficiently reduce the crop to small enough pieces that can be easily tilled in. It is important to choose the appropriate date to mow or otherwise “terminate” the cover crop in order to allow enough growth time to realize the full benefit of the crop while also providing ample time after cutting for the plant tissue to break down prior to laying plastic. If the cover crop is cut and incorporated too late in the season, it will not decompose sufficiently and may get hung up in bed-laying equipment. Thick grass stalks that are not decomposed may also puncture the plastic in newly laid beds. The rates at which cover crop tissue will decompose are dependent on crop type, soil moisture, and temperature. Legumes will generally decompose more rapidly than grasses. Some soil moisture is required for microbes to break down tissues; however, excessive moisture can delay decomposition. Additionally, warm temperatures generally lead to quicker decomposition than cool temperatures. Finally, consider that, for some legumes, it is ideal to kill the cover crop before seed-set so that more nitrogen will be retained in the plant tissue instead of being transferred into the seed. The nitrogen in the plant tissue will be more readily available to subsequent crops than nitrogen stored in the seeds, and there is less chance that “volunteer” plants will emerge later. 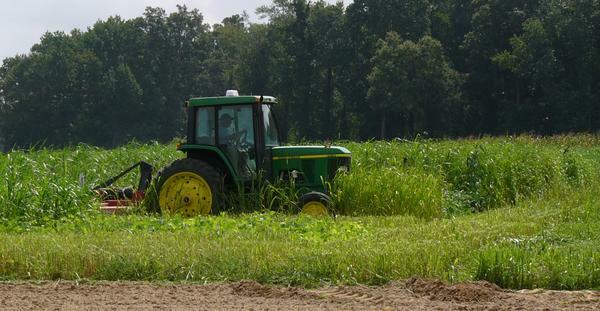 A general approach might be to mow the cover crop at least twenty days before laying plastic, and incorporate the cover crop either immediately or soon after mowing. Table 1: Common summer cover crops for strawberry production in the Southeast. *The specific varieties mentioned after each cover crop name are varieties that are specifically adapted to the Southeast. **This list is not meant to be exhaustive of all cover crops or companion crops that are appropriate for the Southeast. Consult your local extension personnel for specific information on species, seeding rate, and other considerations for your specific region. Beneficial soil inoculants are materials that are added to the soil with the goal of introducing or re-establishing populations of “good” soil microbes that will promote plant growth. There are many different materials available that can be used for this purpose, and it is important to note that the application of compost can also introduce and support diverse soil microbial populations. Two types of materials that have been investigated are vermicompost (compost made by earthworms), which has high microbial activity, and arbuscular mycorrhizal fungi (AMF), which are fungi that form beneficial relationships with plant roots and help the plant scavenge the soil for nutrients. The use of these types of materials in fumigated systems continues to be investigated in the Southeast as a way to re-introduce “good” microbes back into the soil following fumigation practices. Previous research has shown that adding vermicompost and arbuscular mycorrhizal fungi (AMF) to the planting hole increased yields as compared to non-inoculated plants. The idea of adding these inoculants to the plug media is continuing to be researched. For more information on the use of these two inoculants and methods for their incorporation into strawberry plug production, see the following demonstration video: The Use of Beneficial Soil Inoculants for Strawberry Tip Production. Cover cropping and applying compost add large quantities of plant nutrients, particularly nitrogen, to the soil. It is important, however, to remember that not all of the nitrogen applied via compost and cover crops will be available to the next crop. This nitrogen becomes available over time through subsequent cropping cycles. Nitrogen fertilizer additions in the subsequent cropping cycle should be reduced accordingly to avoid burning plants and wasting money. You must therefore estimate the amount that will become available during the subsequent cropping cycle. The amount (lbs. per acre) of plant tissue or material applied to the soil. Percent (%) or concentration of nitrogen present in the plant tissue or compost material. Percent (%) of the nitrogen present in the material that will be available to the next crop. This example calculation estimates that 48 lbs. of N per acre from the compost and 47 lbs. (rounded up from 46.89) of N per acre from the cover crop will be available in the upcoming season. This is a total of 95 lbs. of N that will be available to the subsequent crop. Using this estimate, a grower could decide to eliminate all pre-plant nitrogen fertilizer additions and reduce subsequent spring fertigation applications. Plant tissue analysis should always be relied on to monitor the nitrogen status of the crop, as factors like weather, soil type, and temperatures will influence the rate at which soil nitrogen becomes available. Plant tissue analysis protocols will be covered in the following section. Remember that soil-incorporated materials will supply a greater percentage of the total nitrogen content to the subsequent crop than materials left on the surface. To estimate the amount of cover crop plant tissue present, cut down the plants in one square foot, weigh them, and multiply the weight by 43,560 to get the weight per acre. Many testing agencies can analyze samples of either plant tissue or compost to provide information about the amount of nitrogen present and estimate the amount of nitrogen that will likely be available to the next crop. You can use this information to determine how much compost is needed to supply a desired amount of nitrogen per acre, or alternatively, how much nitrogen has been applied by a cover crop or by previously applied compost. Wet weight refers to the amount of nitrogen in fresh tissue. Dry weight refers to the tissue after it has been dried in an oven to remove the water weight. The units of your calculation must be in the same weight method. If you use the wet % nitrogen concentration with the dry weight application rate you will over-apply nitrogen. Consider that while nitrogen availability rates may vary from 20 to 80% over the subsequent cropping cycle; 70 to 80% of the phosphorus (P) and 80 to 90% of the potassium (K) applied will be available in that first year. It is important to be aware of compost’s phosphorus and nitrogen contents as you can over apply these nutrients to the point that they are toxic to the plant or cause environmental harm. Plant tissue testing is a great tool for monitoring nutrient availability in the soil and for detecting nutrient problems before visual symptoms appear. This is important for determining nitrogen fertigation strategies in the spring, especially if rates are reduced following cover crop incorporation or compost application. Plant tissue testing should begin before the first fertigation application. Testing should continue bi-weekly if no problems are detected or weekly if a deficiency is found through the early fruiting part of the season. To sample plant tissues, collect 25 to 30 mid-tier leaves from throughout each management zone. Separate sampling should be done for each management zone or area under different soil type, variety, or fertilizer schedule. Mid-tier leaves are fully expanded leaves that are three to five leaves back from the growing point. Detach the leaves near the crown, and separate the petioles from the leaflets immediately. Place the leaflets and petioles in separate paper bags, and submit everything as one sample. Timely submission of the sample will improve the accuracy of your results. *However, when anthracnose is present, hand removal of infected plants is not recommended. 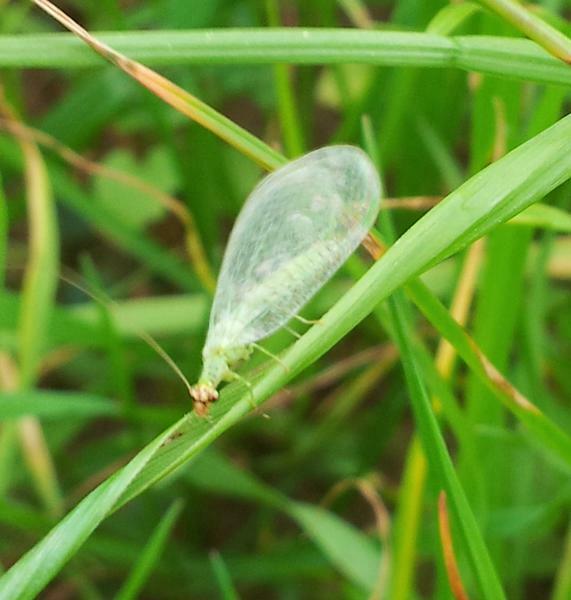 Regular scouting and monitoring of pests during times when they may become economically damaging is critical to controlling emerging populations. A pest population that is detected early might be more easily controlled with a small, targeted pesticide application than that same population a week later. A good scouting plan is to walk through the field in a zigzag pattern and look randomly at the tops and undersides of leaves. Keep notes of when an issue is found, flag the spot, and continue to monitor those areas. 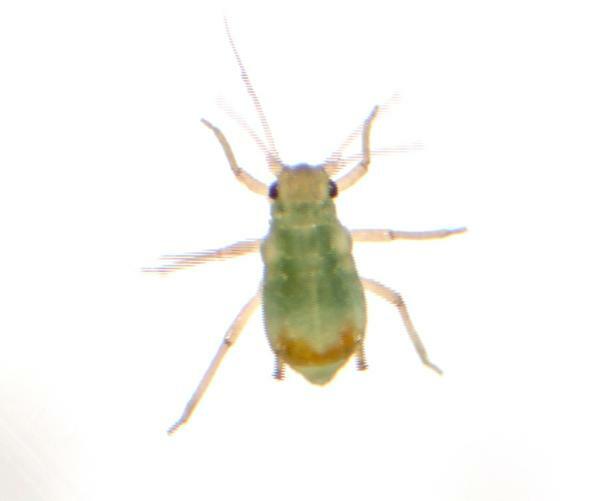 Part of scouting and monitoring is being able to accurately identify what insects or pathogens are in your field! Remember not all insects are bad for your crop and some, like ladybugs (see image) and green lacewings (see image), are actually good because they eat damaging pests. Some practices, such as planting habitat for beneficial organisms, may help support populations of these “good” insects. 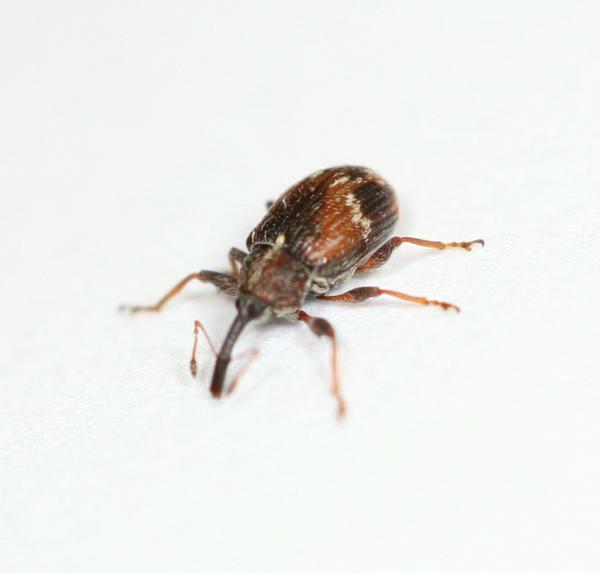 For help in identifying common insects, see the “Guide to Strawberry Insect Pests” in the “Other Resources” section (see section). Also, there are various offices and labs that can help you identify pests or disease issues in your field. Consult the list of testing agencies at the end of this publication to identify an office near you. Once you know what pests or pathogens are present, you also need to know at what point they become economically damaging or the level at which action should be taken to prevent economic damage from occurring (e.g., economic threshold). Treating prior to reaching the economic threshold may cost more in chemical application costs than the value of any yield that might be saved from the insect’s feeding. For example, spider mite populations in the late part of the harvest season are not likely to impact yield. Also, preemptive sprays may eliminate populations of good insects that would otherwise help to reduce the pest organism’s populations. 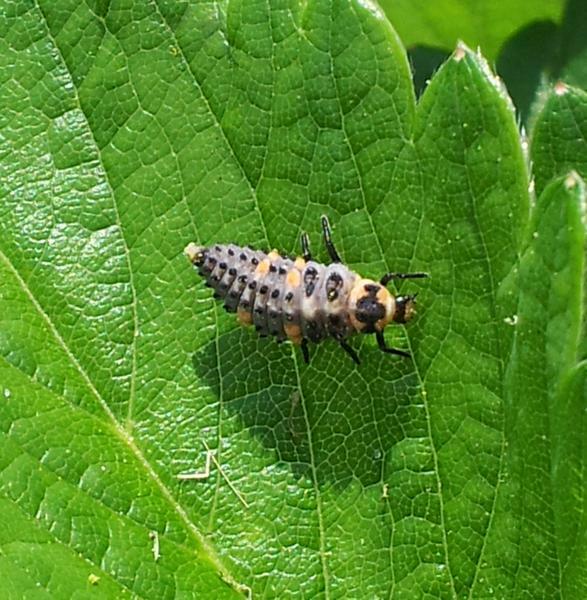 For instance, if you have a population of aphids in one part of your field but also a large population of ladybugs, which eat aphids, you may wish to wait several days before deciding to treat and allow the ladybugs to act as biological controls of the pests. It is also important to be aware of non-target effects during flowering, as certain pesticides are toxic to bees. Please consult the “Other Resources” section (see section) for other guides and information on IPM practices, including threshold levels for some pests and more recommendations about when to treat. This section does not provide an exhaustive list of all the cultural, physical, biological, or preventive methods that can be used to manage all strawberry pests. However, prevention, early detection, and appropriate controls are vital to minimizing the damage caused by pest populations. 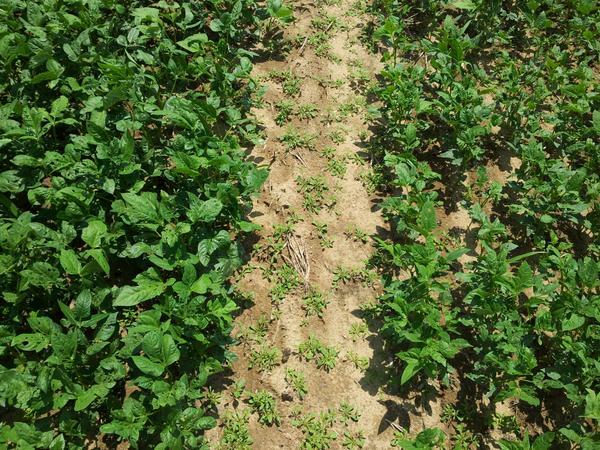 Cowpea established with pre-plant applied compost (left-side) and without compost (right-side). Flail mowing a summer cover crop. Figure 1. Calculating how much nitrogen (N) is applied. **The values used for estimates of nutrient availability in this example are not applicable to all composts or cover crops. Before setting out to incorporate new sustainable practices, it is important to consider how they will fit into your current production system in terms of availability of equipment, resources, and time. The calendar below outlines a general production schedule for incorporating the soil management practices of compost and cover crops into typical plasticulture strawberry production in the Southeast. This calendar is specific to the piedmont of North Carolina in a typical climatic year; dates should be shifted two weeks later in the fall and two weeks earlier in the spring for the coastal plain, or two weeks earlier in fall and two weeks later in spring, for the mountains of North Carolina. Growers outside of North Carolina will need to alter the calendar dates according to their local conditions. Plasticulture production calendar for sustainable practices in strawberries. * For more specific information for each of these activities, please consult the associated chapter or section in this publication. For sustainable practices to have a real impact on the long-term sustainability of the farm enterprise—in terms of improving soil physical properties, reducing soil erosion, reducing insect and disease pressure, promoting beneficial insect populations, and contributing to the bank of nutrients within the soil—they must be adopted and implemented over the long-term. Drastic changes in soil quality or pest reduction cannot be expected within the first year of a new practice’s implementation. However, as strawberry producers continue to increase their production, find new ways to market their farms, and grow their businesses in general to preserve the farm for the next generation, the importance of sustainable production practices that maintain land for the future cannot be forgotten. Integrated Pest Management for Strawberries, 2nd Edition. University of California Agriculture and Natural Resources. Publication 3351. Production Guide for Organic Strawberries. Cornell University. NYS IPM Publication No. 226. Sarrantonio, M. 2007. Managing Cover Crops Profitably, Building Soil Fertility and Tilth with Cover Crops. Edited by M. Sarrantonio and A. Clark. 3rd ed. Beltsville: Sustainable Agriculture Network. USDA, Economic Research Service. U.S. Strawberry Industry (95003). Accessed on 5/4/2014. USDA, National Institute of Food and Agriculture. Legal Definition of Sustainable Agriculture. Last updated: March 18, 2009. An innovative strawberry grower and longtime friend of sustainable agriculture. 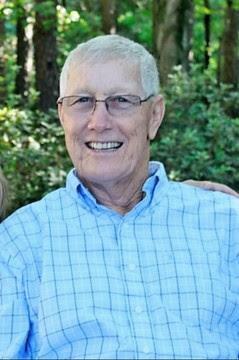 Thanks to the Vollmer Family for the use of the picture of John Vollmer. All other photos taken by Amanda McWhirt unless otherwise noted. Contacts for nematode testing compiled in part by Terrence L. Kirkpatrick. A very special thanks to Debby Wechsler and Mary Helen Ferguson for contributing their superb editing talents and insightful recommendations to this publication. Debby has served both the North Carolina Strawberry and North American Raspberry and Blackberry industries for over 20 years. Mary Helen is a former NC State University graduate student and North Carolina Extension Agent. She is currently pursuing a PhD at LSU. Thanks to the Vollmer Family for the use of this picture.